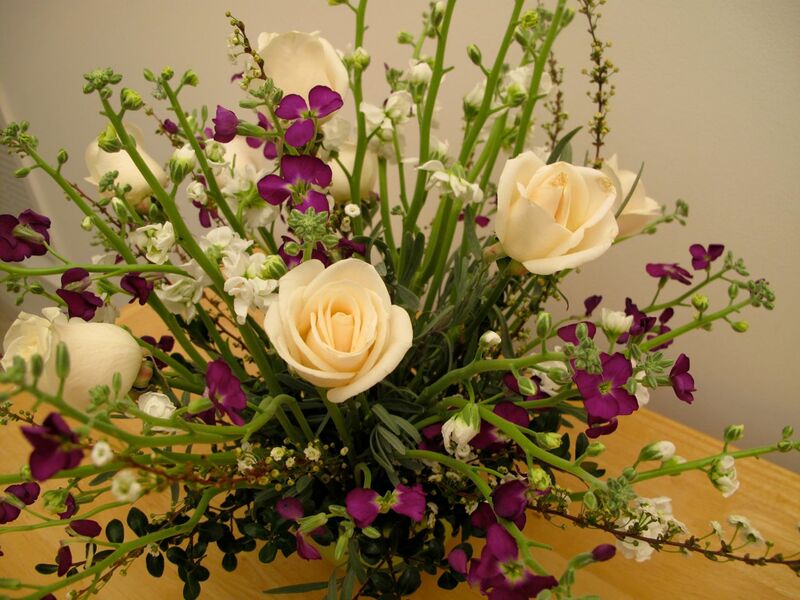 Monday brings the chance to practice flower arranging by joining in Cathy’s weekly challenge In A Vase On Monday, where the goal is simply to fill a vase using materials gathered in one’s own garden. Sunday morning the garden was coated in frost and the supply of flowers is dwindling quickly. 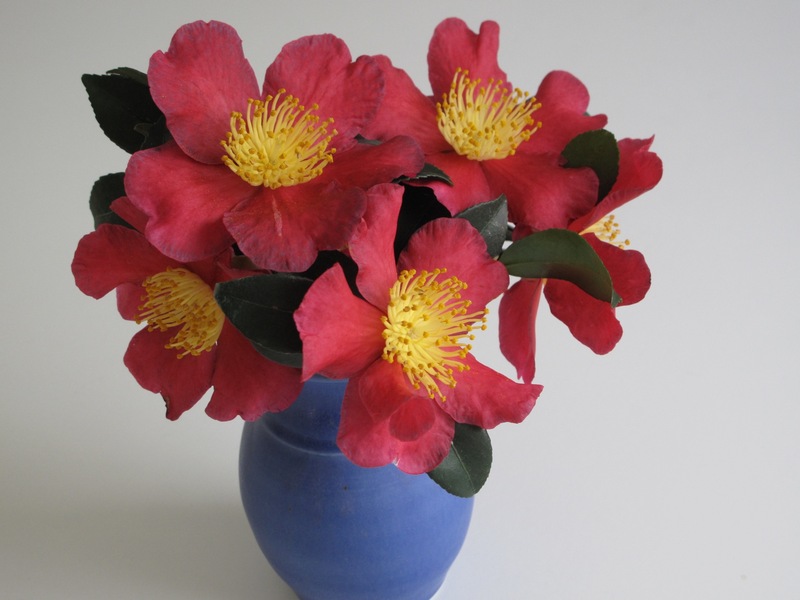 Today’s offering is a simple collection of Sasanqua Camellia ‘Yuletide’ placed in a small blue ceramic vase. I remember Yuletide camellias floating in a glass dish at many Thanksgiving dinners. This camellia seems early this year. It has been flowering since October 24. I wanted to share a second practice vase today, although these flowers did not come from my garden. On an outing with some friends earlier in the week I came across something called the Perfect Arranger. The device is stainless steel armature with a weighted base that holds flower stems tightly in place without the need for using floral foam. I bought two sizes of the arrangers (as well as an Ikebana holder and some clippers). 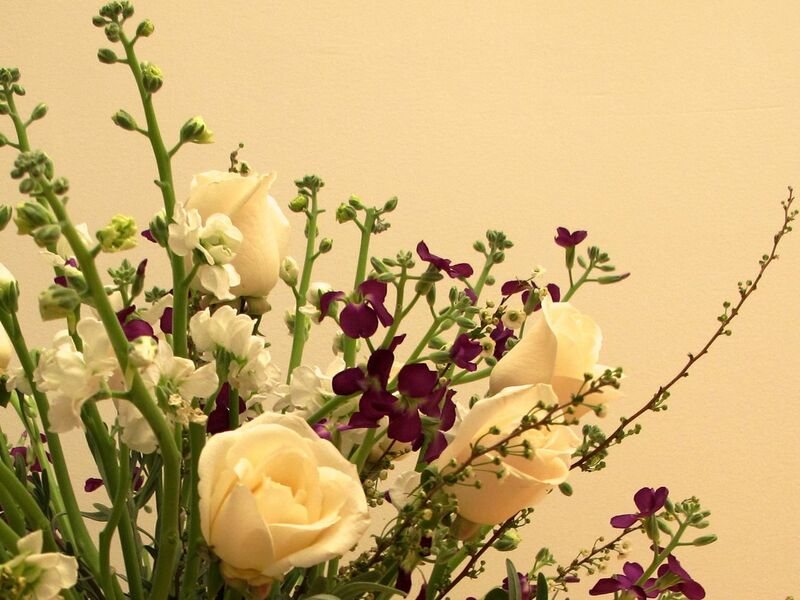 I was anxious to experiment with my new toys, so when I found 20 long-stemmed roses on sale this weekend for $10, I indulged myself with a rare cut-flower purchase of creamy white roses with apricot-tinged centers, purple stock and eucalyptus. I inserted the larger arranger into a crystal urn and it worked great to hold the flowers snugly in place. As always a big thank you to Cathy at Rambling In The Garden for organizing and hosting. It is always fun to discover what she and others are placing In A Vase On Monday. 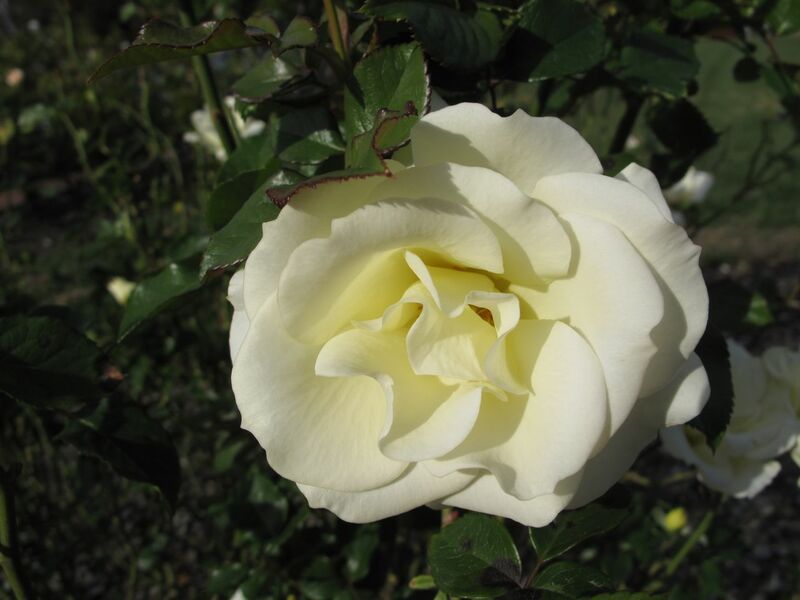 This entry was posted in garden and tagged Camellia sasanqua 'Yuletide', Eucalyptus, flower arranging, flower design, in a vase on monday, nature photography, rose, stock on November 16, 2015 by pbmgarden. 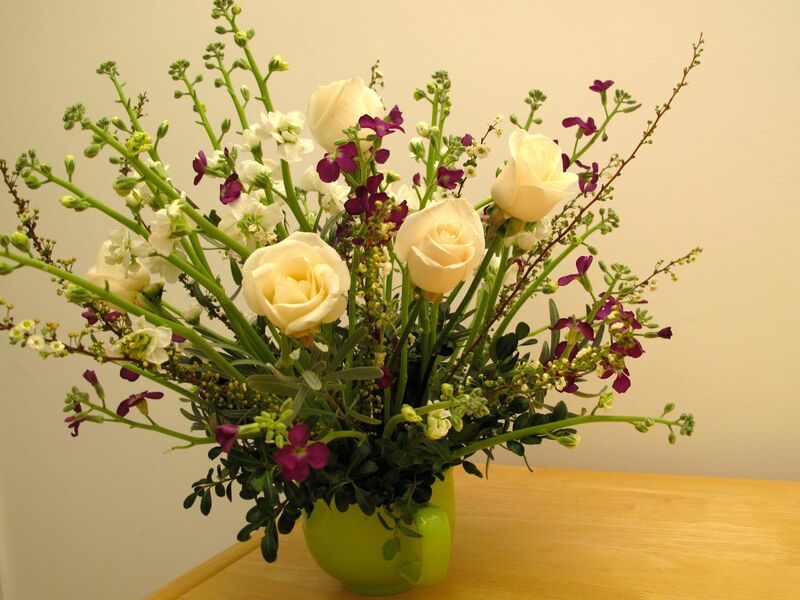 Although I have already posted pictures of flowers in a vase today here is another arrangement. 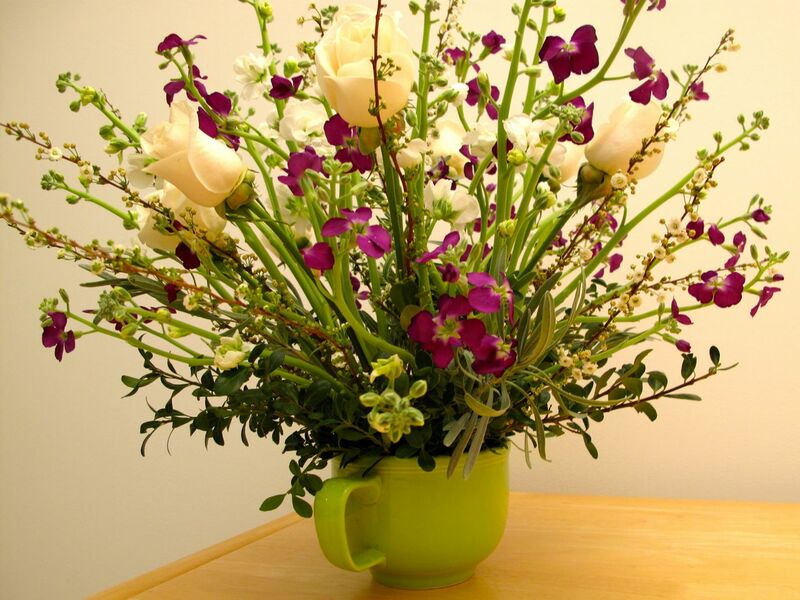 My garden club meets tomorrow morning and each member has been asked to bring in a mug of flowers to set up on a table for a cheerful spring display. 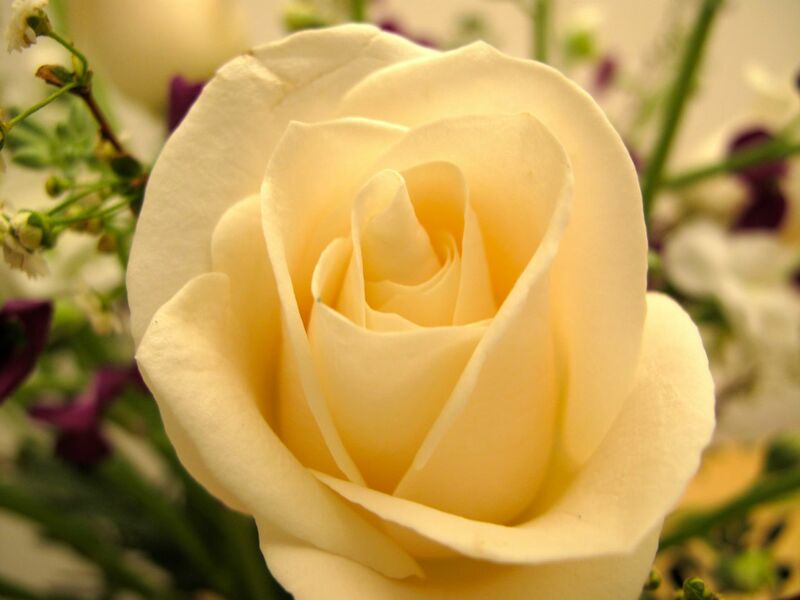 With this in mind, on Sunday I purchased some purple and white stock and some white roses tinted with the barest apricot hue. The flowers were not in pristine condition, especially the roses, but I used them anyway tonight to create a round design in a heavy, lime green soup mug. 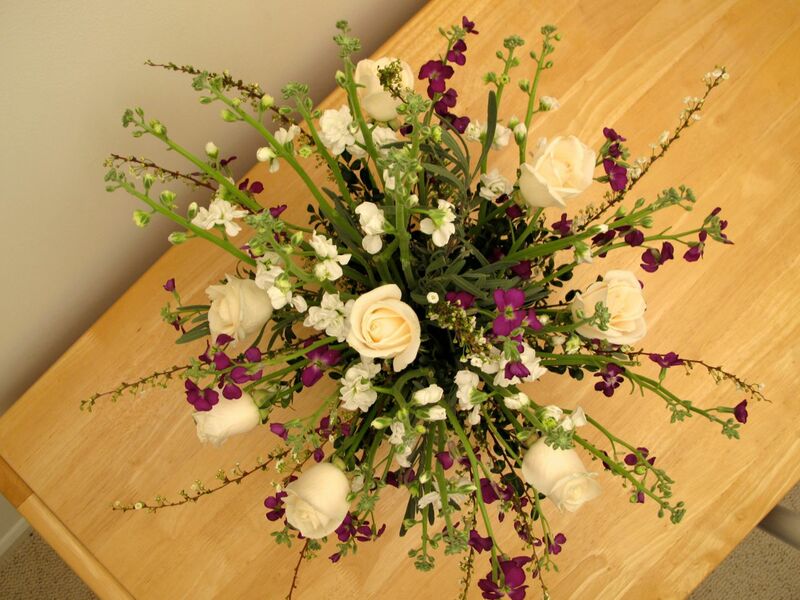 I filled out the arrangement with stems of Japanese holly, branches of spiraea and a few sprigs of lavender. In thinking about how the design turned out I would change several things. 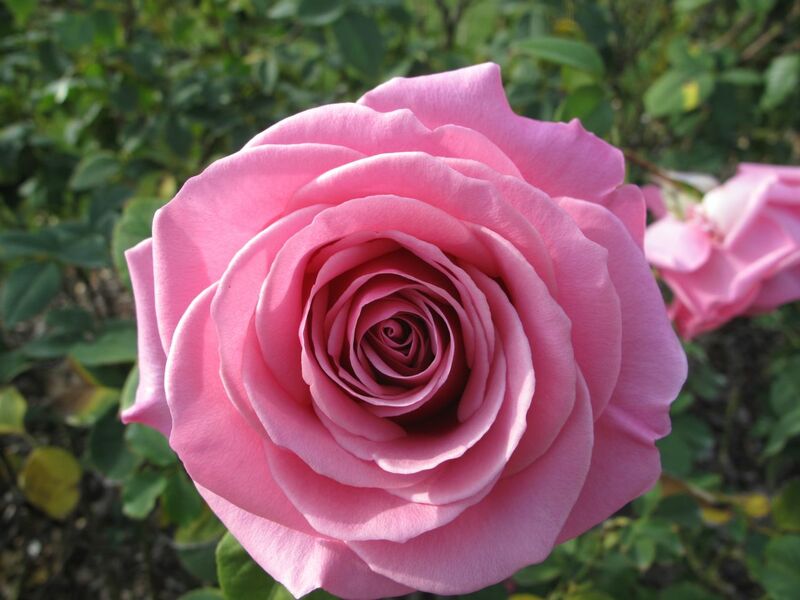 I would increase the number of roses and reduce the stems of stock. Perhaps I will like it better when the stock finishes opening. I used the Japanese holly stems around the base of the mug to hide the florist’s foam and it seems very dark and dense. Next time I might opt for lavender or something else that is lighter. I also cut the roses too short and should have adjusted the other material accordingly. In fact, lowering the arrangement by several inches might improve the overall proportions, but overall I am please with the balance. 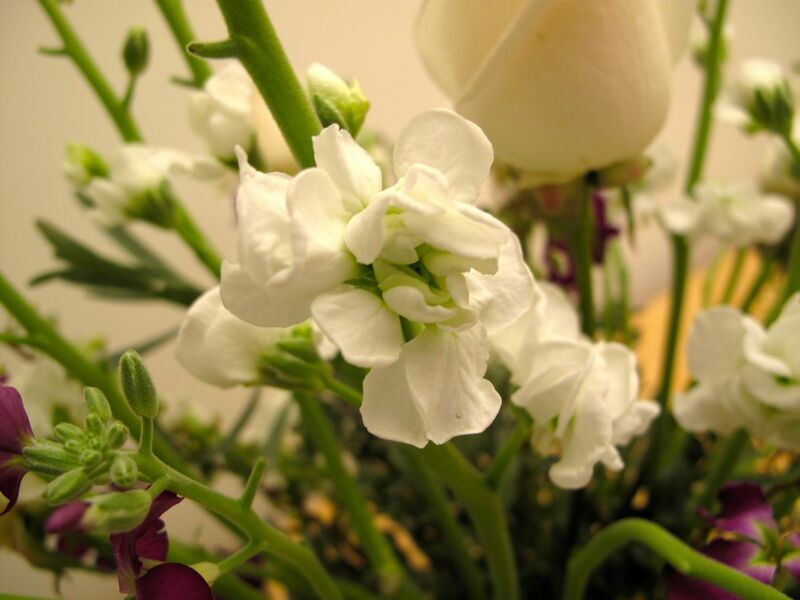 The white stock is especially pretty, more fully open and fresher than the purple one. This was a fun design to create and it is always a good learning experience to work with different materials. It will be fun to see the other members’ mugs. 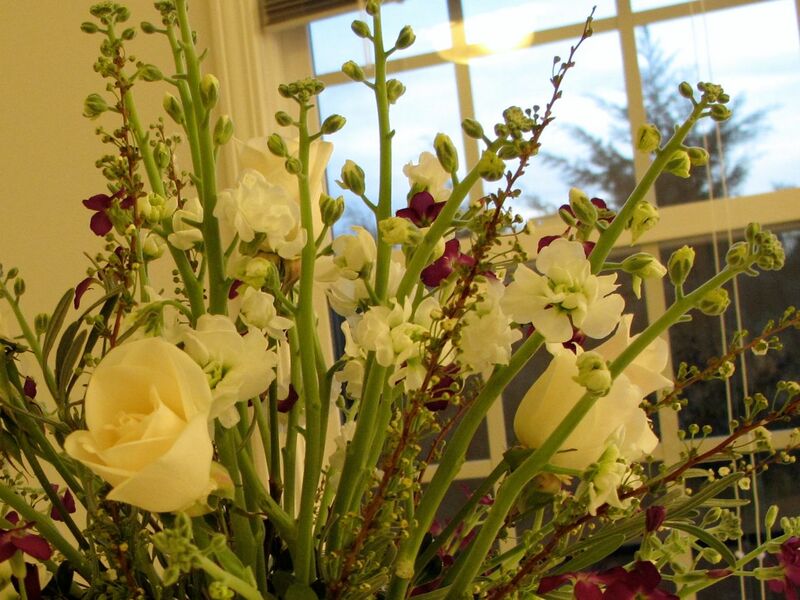 The spring garden table will be overflowing with flowers at tomorrow’s meeting. 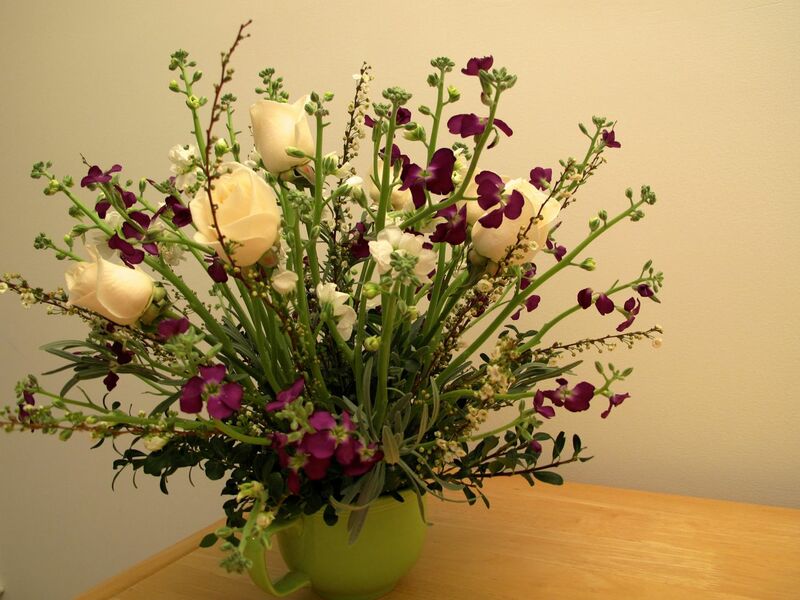 This entry was posted in garden and tagged floral arranging, Floral Design, flowers in a mug, garden club, rose, stock on March 24, 2014 by pbmgarden. Thunder rumbles in the distant night after a nice spring day. There was a brief shower early this morning and then the sun peeked in and out. 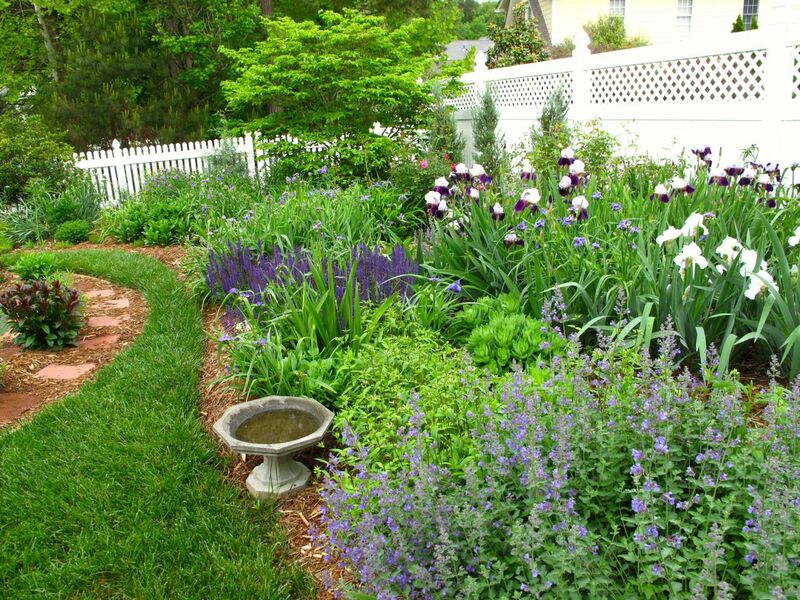 Temperatures are warming and the garden quickly has become more lush and full, a very different garden than just a few days ago. Echinacea and Canna are emerging. Tender young foliage weaves in and out offering strong textural and color contrasts, although they are more observed than actually planned. 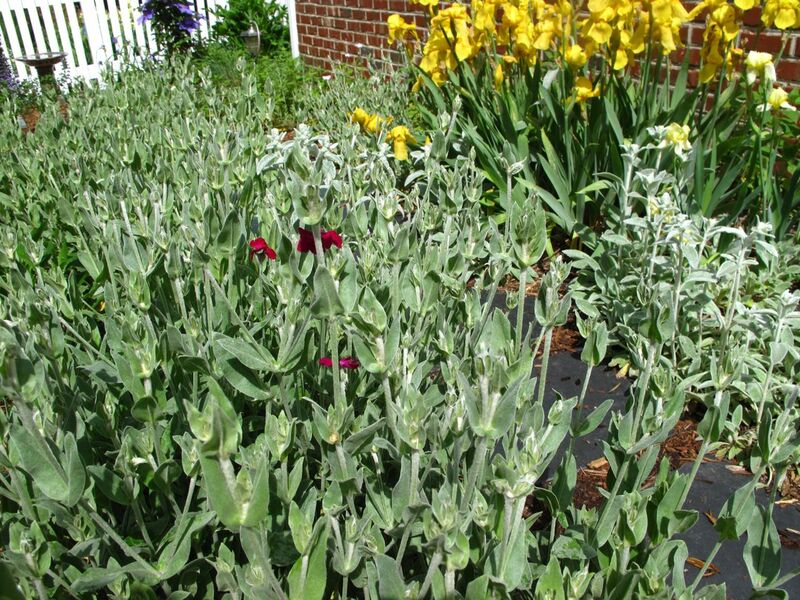 Only a few flowers are present so far in this massive planting of Lychnis coronaria (Rose Campion). The highlight of the garden is the Irises, now in full bloom. 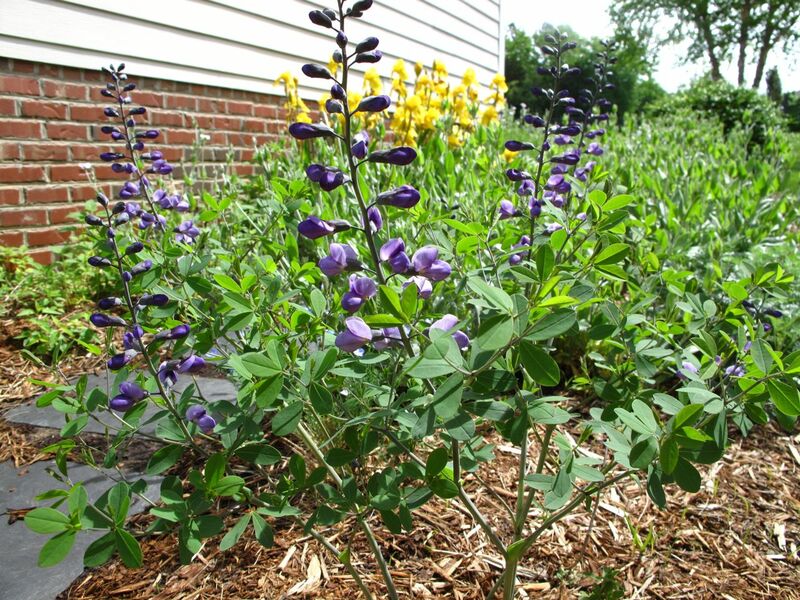 This entry was posted in garden and tagged almanac, Baptisia 'Purple Smoke', echinacea purpurea, iris, rose on May 8, 2013 by pbmgarden. 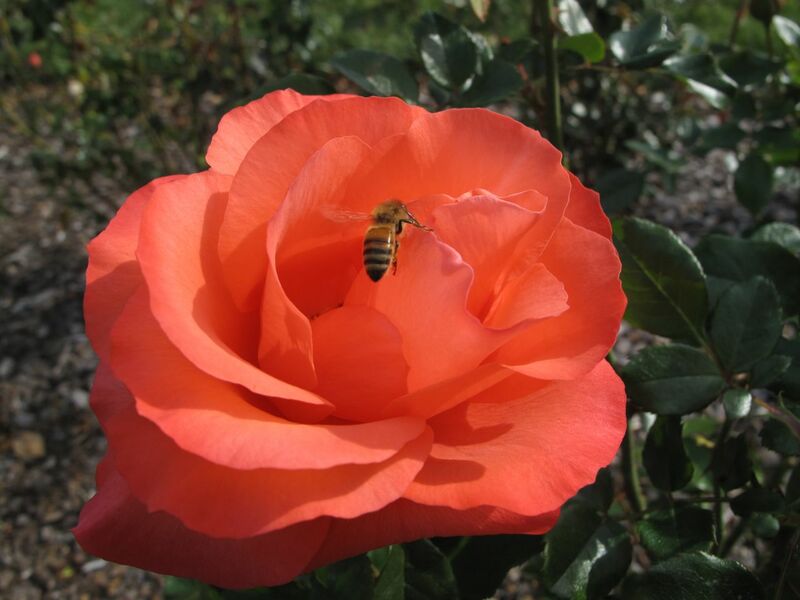 During a walk on the UNC campus yesterday we spent a few minutes in the rose garden at Morehead Planetarium and Science Center to enjoy some lovely and fragrant blooms. 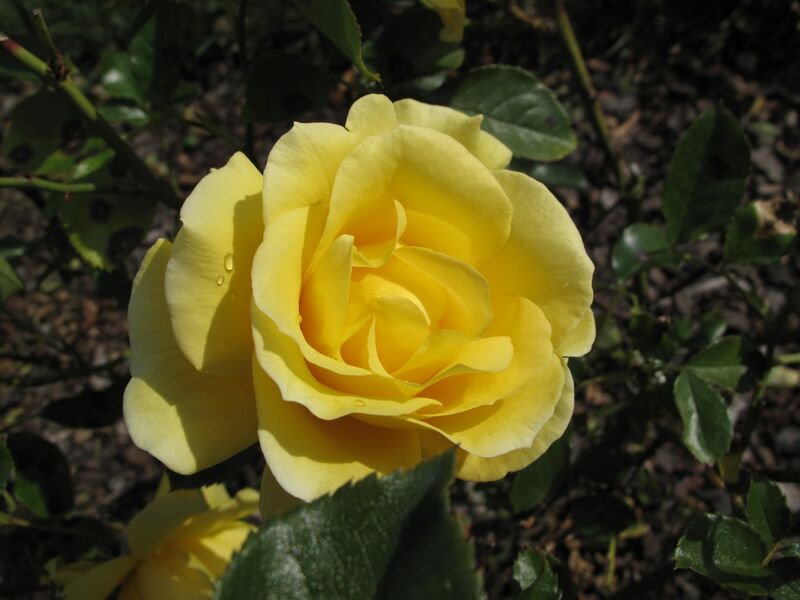 I have only a couple of roses in my own garden, so this rose garden, a well-known attraction in the area, is a great place to stop to see lovingly tended and perfectly formed flowers. 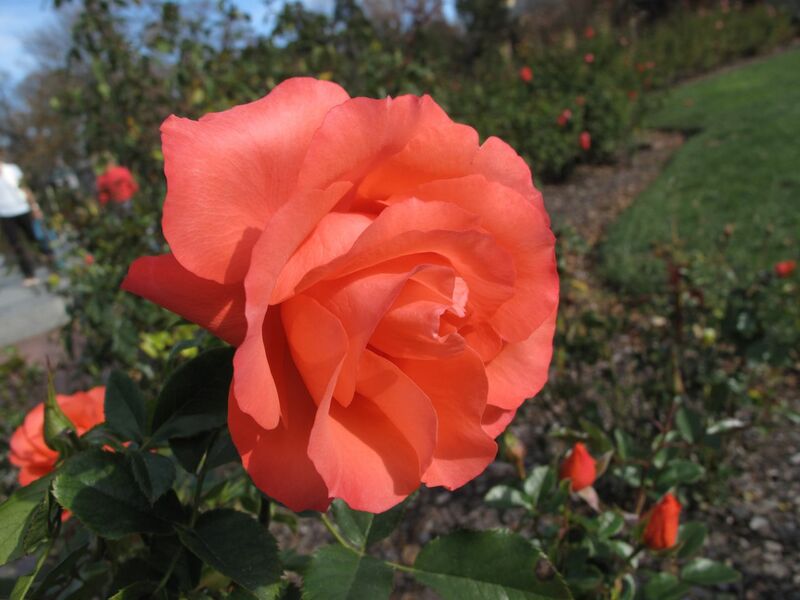 I was not sure how the roses would look at this time of the year, but the garden always looks spectacular in time for graduation in May. 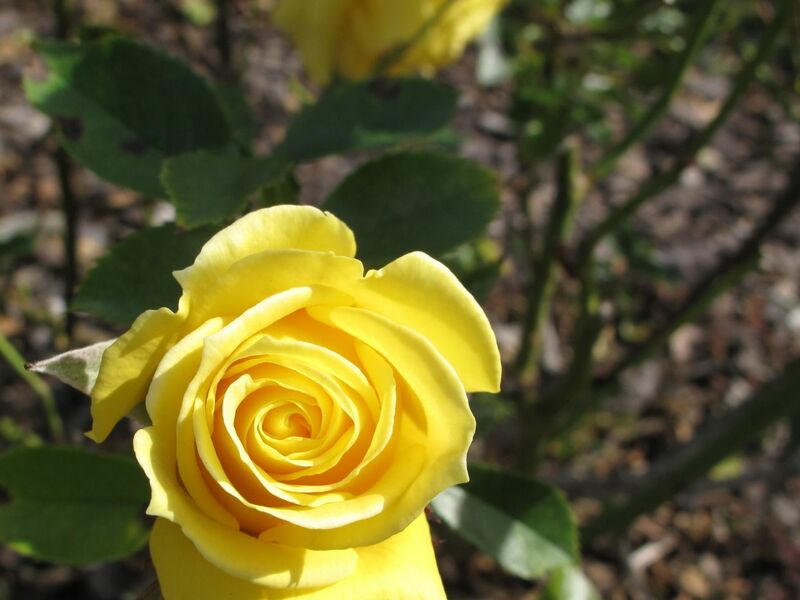 The roses are planted around a 36-foot diameter sundial with a 24-foot long (and 20-foot high) gnomon that casts the shadow for telling time. 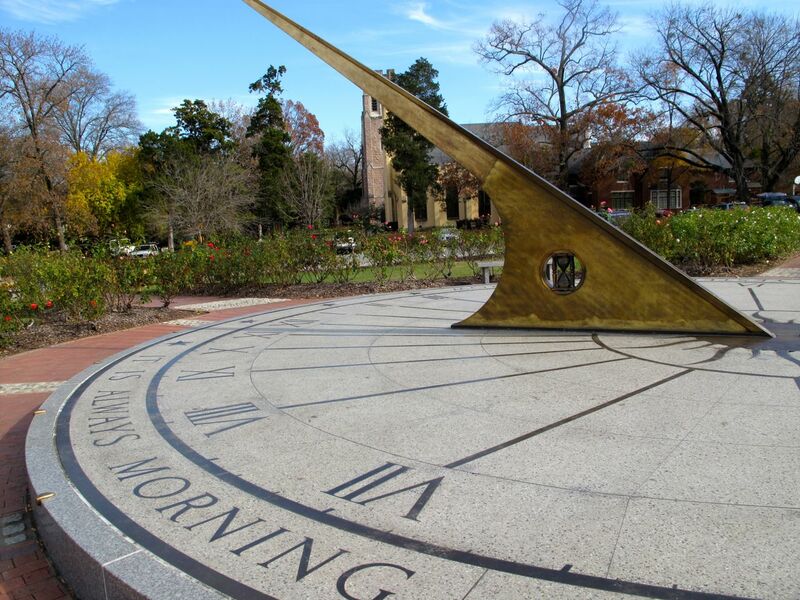 Around one edge of the bronze and marble sundial are the words, It is always morning somewhere in the world, while the other side reads Today is yesterday’s tomorrow. 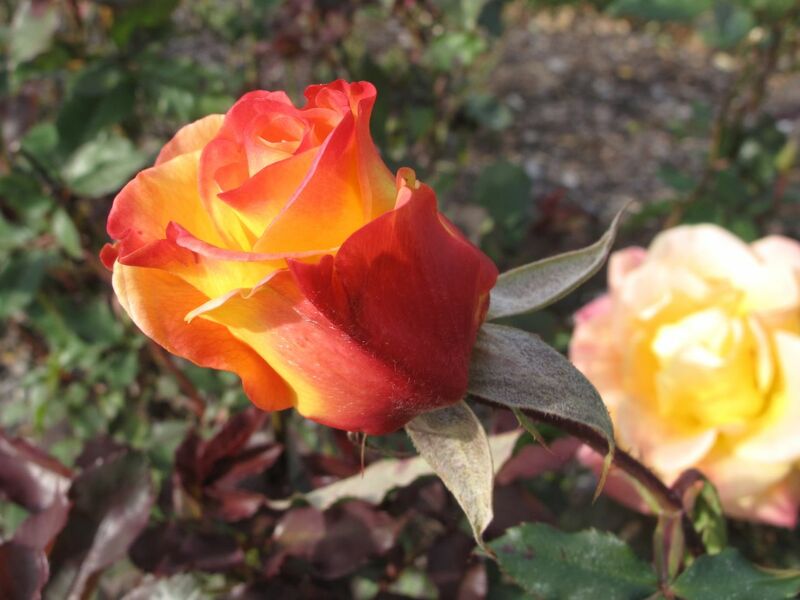 This entry was posted in garden and tagged autumn blooms, Morehead Planetarium, nature photography, photographing nature, rose, rose garden, sundial on November 24, 2012 by pbmgarden.